Chinese New Year – officially the time of the year where humans migrate by the billions. Also officially the worst time of the year to hit the highways in Malaysia because of the traffic. So what’s the best thing to do when you get stuck in a jam? You guessed it, MAKAN! These places are certified Halal so you can “pig” out guilt free! And as a bonus, these restaurants are situated quite near the highway so you don’t have to tahan your hunger for that long. First on the list is Yik Mun. It was established in 1926, so they’ve been serving mouth-watering Hainanese cuisine even before your mama was born. Besides the bouncy and soft kaya paus, you have to try their chicken chop! Smothered in their signature sauce and fried to perfection, this will take your balik kampong jam blues away. So you’ve heard of beef steak & chicken steak, but how about Egg Steak? Legend has it that Yut Loy was the hangout for the students of MCKK (Malay College Kuala Kangsar). Not being able to afford a chicken or beef steak, a hungry Old Boy (that’s the nickname for MCKK students, ya. Not an actual old boy) requested for a fried egg with the usual sauce and serving of fries. The item has stuck ever since. But don’t just go for the egg steak, try everything else on the menu! 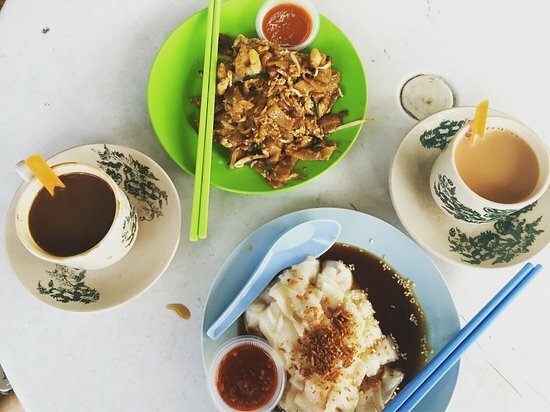 Do you have a craving for Char Kuey Teow or Chee Cheong Fan? If you’ve ever wondered what it feels like to eat at a Chinese coffee shop without worrying about the halal factor, this is the place. But the food is so good that even the Non-Muslims flock here all the time. And here’s a little trivia for you foodies out there; just behind New Hollywood is another eatery called Vegas Restaurant! For those of you who have never had the opportunity to visit the province of Xinjiang, worry not. Because the nice people of Northern China decided to open up shop right here in Sungai Besi! Savour the hot and spicy pulled mee, have some lamb on a stick, and wash it all down with Chinese Tea! Now you’re all set to hit the highway with a full tummy and happy feet. There are so many reasons why you should visit the historical city of Melaka but if you need another reason to visit this beautiful place, it should be for the chicken rice ball. Ee Ji Ban, about a 30 min drive from the Ayer Keroh exit is a must-go if you’re looking for a place to have lunch en route to Johor, or simply just for fun. A slew of celebrities have been here so you know the food has definitely gone viral, in a good way. So, make the stop and let a ball of pulut rice slide down your throat and take you to food heaven! So that’s our list! We’re sure you have a lot of other places to suggest and we are all ears (and mouth)… so keep those recommendations coming! Last but not least, Happy Chinese New Year and drive safe. We hope these places will give you something for you to look forward to on your drive!